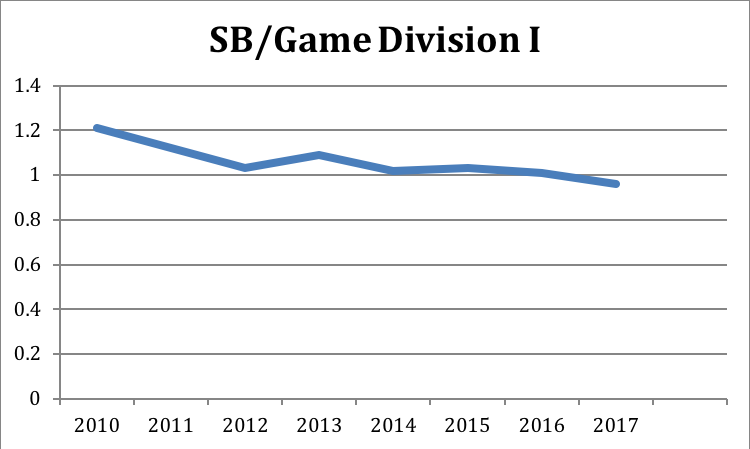 Since the end of the BESR era, there was a downward trend of runs per game, home runs per game, and stolen bases per game in college baseball. After introducing flat-seam balls, home runs per game and runs per game have been on an upward trend. Both of these rule changes would seem to have no impact on stolen bases per game, and why would they? Analytics suggests that stealing bases is not worth the risk. I still believe there is value in stealing bases in today’s game, and the decline of it has hurt teams’ performance, especially squads that are at a disadvantage to Power 5 Conference teams. Programs such as Wright State, UCF, UCONN, and Campbell are able to stay competitive year after year by implementing the run game in their offense. In 2018, 38 of the top 50 teams in stolen bases had a record above .500, while 38 of the bottom 50 teams in stolen bases have a record below .500. 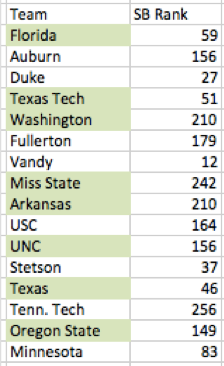 Out of the 35 non-Power 5 teams in the 2018 NCAA Tournament, 14 of those teams were ranked in the top 50 in stolen bases.